A masterfully engineered, lightweight body and rear-wheel drive chassis help you extract every ounce of performance. All 2019 Toyota 86 models include the features shown below. Additional equipment and option upgrades are available. If you need specific answers about the Toyota 86 Trim Packages, Upgrade Options or Available Inventory, please Contact Us today. Color only available with All-Season Tires. At the heart of 86 is a potent 2.0-liter flat-four engine. With its horizontally opposed pistons and compact packaging, this engine sits low in the chassis for optimal balance and performance. In manual transmission-equipped cars, this engine has been revised to reduce friction and pumping loss, helping to provide an optimized power curve. It’s got some muscle too, with manual transmission cars getting 205 horsepower and 156 lb.-ft. of torque, plus a new red aluminum intake manifold. In the automatic-equipped 86, its Boxer engine pumps out 200 horsepower and 151 lb.-ft. of torque. Designed for track days, 86’s unique Vehicle Stability Control (VSC)1 sport tuning allows the driver to shut off all stability assists. When on a racetrack, this Full-Off Mode prevents the VSC from kicking in, putting the driver in full control. This helps expert drivers push the envelope of 86 and extract every last drop of performance. 86 steering wheel-mounted paddle shifters. Prototype shown with options. Production model may vary. Automatic transmission-equipped 86s come standard with steering wheel-mounted paddle shifters. Just a simple pull of the lever allows the driver to quickly change gears while keeping both hands on the wheel. This automatic transmission is intelligent, too—it will automatically rev match when downshifting, giving you buttery-smooth gear changes. A global icon, the AE86 Hachi Roku Corolla helped cement Toyota’s racing cred. With its light body, rear-wheel drive chassis and nimble handling, the AE86 was a force to be reckoned with on the track and the streets. It inspired generations of enthusiasts and the car remains a legend to this day. Toyota took this AE86 DNA and gave it a modern twist to create our purest sports car yet—the 2019 Toyota 86. It’s everything a sports car should be, backed by Toyota’s proven technology. And it’s how we carry the 86 legend forward to the next generation. Let’s fire it up. When on a racetrack, holding the Vehicle Stability Control (VSC) button for one second engages Track Mode, which helps you push the limits of performance. When in Track Mode, the system allows you to approach the handling limits of 86 before the VSC kicks in, after which the system helps to gently nudge you back on your desired driving line. Long hood. Short rear deck. The classic sports car profile. 86 brings this design to the modern era with each surface sculpted to help give this ride a wind-cheating drag coefficient of just .29 Cd. And best of all, this aggressive style helps optimize overall performance, too. The large chin spoiler and integrated canards help keep the front end planted firmly to the ground for sharpened turn-in and response. The restyled rear diffuser improves airflow and reduces turbulent air exiting from under the car, adding function to its street-ready attitude. Brighter light. More efficiency. Striking design. A full complement of LED lighting accentuates the cutting-edge style of 86. Up front, LED lighting is used for the high- and low-beam headlights, integrated Daytime Running Lights (DRL) and turn signals, helping to ensure this sports car won’t be ignored. In the rear, LED lighting is used for the taillights, brake lights and rear turn signals, further taking 86 to a new level of cool. Now “show ’em your taillights” can take on a whole new meaning. Available fog lights seamlessly integrate into the refreshed front bumper of 86. Designed exclusively for 86, these fog lights fit inside the aerodynamic canards, ensuring a perfect fit. Not only do these help provide more light when the weather gets foul, they take the sporty look of 86 to a whole new level. This suede-like material shows off the sophisticated side of 86. All-new Granlux trim accents covers key touch-points on the door panels, upper-seat bolsters and dash. Adding an extra bit of style is an embossed “86” logo above the passenger-side glove box. 86 features an ergonomic, leather-wrapped steering wheel that feels great in your hands and, thanks to the smaller diameter and quick-ratio steering, feels amazing in the corners. And that’s not all—with new integrated audio controls, you get easier access to your music, helping you can stay in control of it all. A standard folding rear seat lets you bring your friends, or your gear, along for the ride. With 6.9 cubic feet of space in the trunk,1 you can fit those gotta-have items you need for a weekend getaway. Folding the rear seat down increases total cargo area, giving you enough space to carry an extra set of wheels and tires for those race-day excursions. Available on 86 is the Display Audio with Navigation2 system. Unique to the Toyota family, this powerful piece of tech features a high-resolution 7-in. touch-screen display. Its navigation functionality with turn-by-turn directions makes it easy to find your way. Better yet, this system also comes standard with the Aha Radio™ app3 with over 100,000 stations, iPod®4 connectivity and six speakers, helping power the perfect sound track for every drive. 2Availability and accuracy of the information provided by the navigation system is dependent upon many factors. Use common sense when relying on information provided. Services and programming subject to change. Services not available in every city or roadway. Updates may be available from your dealer at an additional cost. See Owner’s Manual for details. 3Aha Radio is a trademark of Harman International Industries Inc. Apps/services vary by phone carrier and are subject to change. Data charges may apply. 4iPod® and iPhone® are registered trademarks of Apple Inc. All rights reserved. Every 86 comes standard with Hill Start Assist Control (HAC).5 This convenient technology helps to keep the vehicle from rolling backward when switching from brake to accelerator on an incline. SST® 6 helps reduce engine power when both the brake and gas pedals are pressed at the same time under certain conditions. The feature doesn’t engage if the brake pedal is depressed before the accelerator pedal, allowing time for the driver to move from brake to acceleration. And for those track days, that also means that you can still heel-toe in the manual transmission-equipped 86 without any problems. 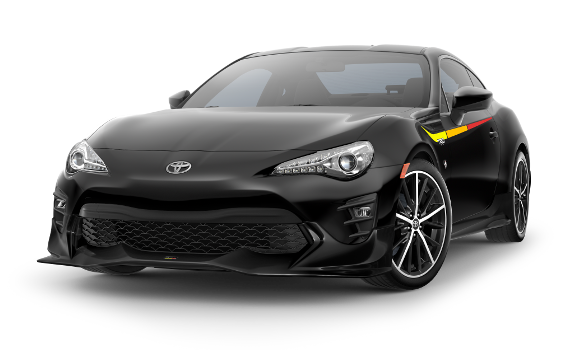 86 comes standard with the Star Safety System&trade:, a suite of six advanced safety features that includes Vehicle Stability Control (VSC) 7, Traction Control (TRAC), Anti-lock Brake System (ABS), Electronic Brake-Force Distribution (EBD), Brake Assist (BA) 8 and Smart Stop Technology® 6. 6Smart Stop Technology® operates only in the event of certain contemporaneous brake and accelerator pedal applications. When engaged, the system will reduce power to help the brakes bring the vehicle to a stop. Factors including speed, road conditions and driver input can all impact stopping distance. Smart Stop Technology® is not a substitute for safe and attentive driving and does not guarantee instant stopping. See Owner’s Manual for additional limitations and details. 8Brake Assist is designed to help the driver take full advantage of the benefits of ABS. It is not a substitute for safe driving practices. Braking effectiveness also depends on proper vehicle maintenance, and tire and road conditions. See Owner’s Manual for additional limitations and details.